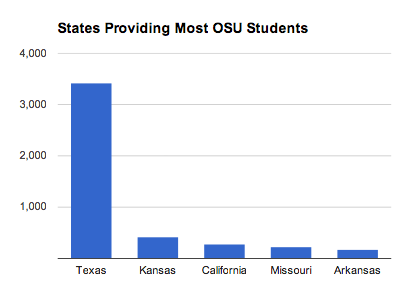 Texas is king when it comes to providing nonresident students to Oklahoma’s two largest universities. In fall 2013, close to two-thirds of the University of Oklahoma’s 7,004 out-of-state undergraduate and graduate students at the Norman campus were from the Lone Star State. Just over half of Oklahoma State University’s 6,569 undergraduate and graduate students enrolled at the Stillwater and Tulsa campuses were from Texas. Texans will likely to continue to migrate north in large numbers as universities in their home state approach full capacity. Sources: OU Institutional Research and Reporting; OSU Institutional Research and Information Management. Five counties in Oklahoma are among the nation’s fastest-growing, according to a newly released compilation by the U.S. Census Bureau.